McKesson Foley Catheter Holder from HealthyKin.com, made entirely of stretch material, has a soft, supple backing for added skin comfort. The elasticity and 2" width of the leg band distribute compression evenly around the thigh to minimize circumferential pressure. It is a simple, cost effective way to stabilize Foley catheters and reduce complications. 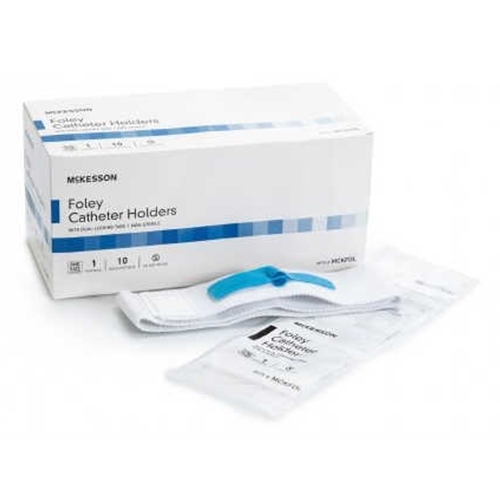 In addition to saving valuable nursing time, the McKesson Foley Catheter Holders stabilize the indwelling catheter, reducing the likelihood of traumatic removal, without restricting patient's movement or irritating the skin. I have found this the best strap for my patients. They never have a problem with it. Stays put - holds well. This Dale 316 is the "Answer" to keeping your foley subra pubic catheter securely in place and it's quickly available with "Superb" service from HealthyKin.com. Love this product. The one I was using, the velcro always snagged the inside of my husbands pants which made them bunch up. This product is designed so that does not happen. Very good design. This is just what I needed. Thank you. Great product. Exactly what we wanted. Great price.